The hypercoaster, that was recently under construction, is now in testing mode. Empty ride vehicles have been spotted running along the truck. 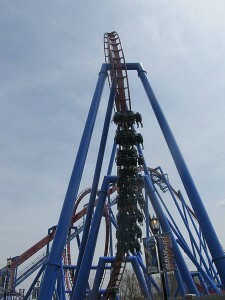 Roller coasters over 200 feet tall are given the designation of hyper coaster. SeaWorld shared a test ride video of its newest roller coaster Mako, giving people a rider’s view of the attraction The video was released on the company’s facebook page a few days ago. The video showed off a number of twists and turns from the first person perspective. The track for Mako, SeaWorld’s shark-themed roller coaster, has been completed and the ride is scheduled to open on June 10, 2016. The roller coaster is now in the testing phase. The new SeaWorld’s roller coaster will be the tallest, fastest and longest in Orlando when it opens this summer. Mako was announced as SeaWorld’s next roller coaster last April. The 4,760-foot-long ride, inspired by the high speeds of the Mako shark which is one of the fastest sharks in the ocean. The ride will feature a 200-foot drop at a top speed of 73 mph. SeaWorld has promised several moments of air time, which is the feeling of weightlessness that roller coaster fans look for. Mako will join the other SeaWorld’s roller coaster rides, Kraken and Manta, as well as the water thrill ride Journey to Atlantis.